The camera and gimbal are good enough for most all standard uses. All but the finest eyes would be hard pressed to tell the difference between online video (vimeo/youtube) generated by a Phantom 3 Standard vs. a Phantom 3 Pro. The same would apply to still images – all Phantom models take a 12 MP (megapixel) still image. Those who want or need more advanced image processing don’t need to read our advice – they can sort out the specs by themselves! The Standard Remote is a simple one and works perfectly using a smartphone for the DJI App and as a monitor. If you intend to use a larger tablet – that’s one good reason for stepping up to the Advanced or Pro models as the Remote is designed differently and can accept larger ipads and tablets. For the budget minded or those who aren’t sure they are going to stay in the hobby – this makes the choice simple – the P3S should do the job well. Note: DJI Products are also available at various retailers – both online and offline. 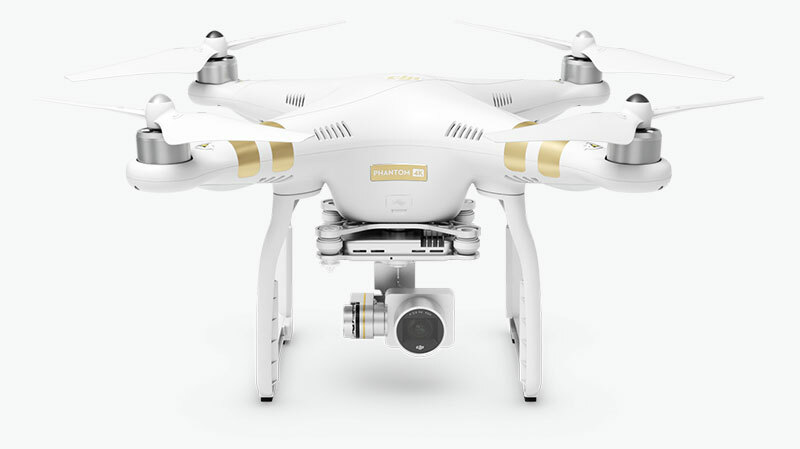 Phantom 3 4K – is a new entry introduced in Jan. 2016 for $999 – as of Sept, 2016 it is reportedly being discontinued but can still be purchased for less than $600 at Amazon. 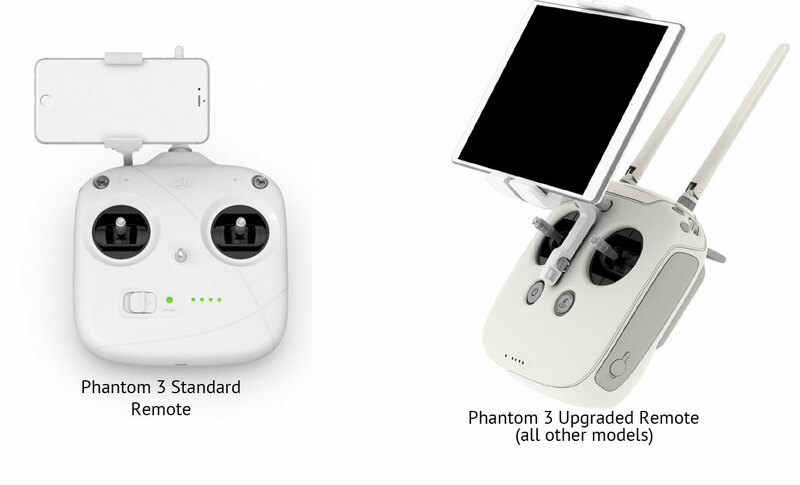 The Phantom 3 4K is essentially the Standard model with a much better camera and the nicer Remote. The camera is the same as on the Phantom 3 Pro (below), while the basic quadcopter body is the same as the standard. If you want the best possible video quality at the lowest price – and flying a mile away is not important to you then the 4K will give you what you need at a better price than the Advanced or Pro model. You are getting everything the Pro model has other than the dual GPS and the “lightbridge” longer range. Phantom 3 Advanced – $799 (list) Street Price about $690 – This model has most all the upgrades – longer range, the dual GPS system, the upgraded remote with tablet holder and the VPS (Vision Positioning System). It lacks the 4K video, however few pilots have the need (or the capability of editing) such large files. The dual GPS is a superior system and the upgraded remote also allows for larger and heavier tablets. An optional modules allows for HDMI output to larger screens, googles, etc. Phantom 3 Pro – $999 (list) Street Price about $850 – This model has all the upgrades – longer range, the 4K camera, the dual GPS system, the upgraded remote with tablet holder and the VPS (Vision Positioning System). It’s the current top of the line in the Phantom 3 series. If you are not on a strict budget and don’t mind having more than you might need (now), then by all means go for the Pro. It’s the one we purchased to review for that very reasons – although we haven’t used the 4K resolution hardly at all. The dual GPS is definitely a superior system and the upgraded remote also allows for larger and heavier tablets. An optional modules allows for HDMI output to larger screens, googles, etc. We hope the above allows you to make sense of the various models and their corresponding features and prices. Most every vehicle is a compromise of sorts – budget comes into play as well as the needs of the operator. For example, if a Standard model will suit you, you can spend some of the extra budget on an extra battery, a case and other needed options. On the other hand if you are a true prosumer the $$ for a Pro model (or Phantom 4) along with extra batteries, case and tablet probably isn’t going to break the bank. If your needs are in-between those two example, the Advanced or the 4K model should suit. In a general sense, the Advanced may currently offer the best overall features for a value price. On the other hand, the new Phantom 4 may be calling your name if you want the latest and greatest.